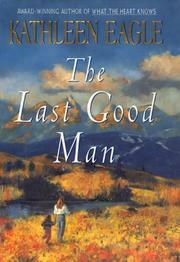 A good man is hard to find, but a romance by Eagle (What the Heart Knows, 1999, etc.) is a good place to start. Flat broke and disillusioned model Savannah Stephens gives up her formerly fabulous career in New York and returns home to Sunbonnet, Wyoming. No one knows why she’s back, but Clay Keogh, a local rancher, intends to find out. Clay has loved Savannah ever since he can remember, although he suspects that her six-year-old daughter, Claudia, may be his brother’s child. He can’t be sure, however, since Savannah isn’t telling and his brother, an Indian activist, has been running from the FBI for years. Strong, silent Clay bides his time until Savannah reveals that she has been treated for breast cancer and now believes her once-perfect body is too flawed for a sexual relationship. Clay attempts to reassure her, but Savannah guards her heart. Then he makes an impulsive offer: bed, board, and (most important) health insurance so she can obtain the follow-up care she so badly needs. She’ll have to marry him, but in name only, no strings attached. Touched by his kindness, Savannah agrees and begins sorting through her emotions in a breast cancer survivor’s group. She decides to do something in return for Clay, a skilled farrier who often buys old, sick horses and nurses them back to health. Savannah pulls strings to help him start a retirement farm for horses whose owners can afford to buy them a happy old age. Clay is delighted, the wary Savannah is finally won over by his gentle strength, and soon Claudia is blossoming too, no longer afraid of losing her mother. Here, as in much of Eagle’s work, good things happen to good people, albeit after much travail. Unlike most romance writers, she avoids the usual ornate rhapsodizing in favor of a rugged lyricism that suits her mountain setting down to the ground. Heartfelt and homespun, with a believably gallant hero who (sigh) never asks stupid questions.